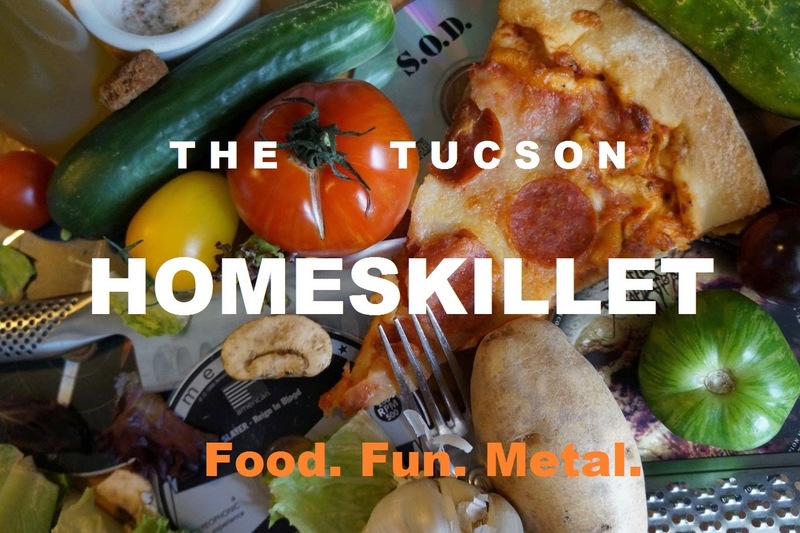 The Tucson Homeskillet: The (Tucson) Homeskillet is back! All I have to tell you kids is that it has been a rough couple of years for me. Since leaving the life of a chef, my day job consists of working in my local public library. Yeah, you'd think I would have PLENTY of time to eat and write about what I just ate. Uh, no. It's a far busier enterprise than I had anticipated and my last few posts were literally me eating junk food after too many cocktails. Then in 2014, my wife and I shared a most disastrous year. In early spring my step dad, my dad's husband, died from complications from Alzheimers. Then a few weeks later, my dad died from complications of a broken heart. A month later, my wife's grandmother died. Right around that time, our dog, Deacon, a Siberian husky, suffered a stroke and was living with cancer so we had to put him down. Then after that, we found our cat had been ravaged by coyotes finding only a leg and head in our back forty. So...whew! Not a good time to say the least. It was rough, but when 2015 rolled around, we knew we had to get back to work and get back to being awesome. Which is why I am "reforging the sword" so to speak with re-launching The Homeskillet as a site that will entertain, enlighten, educate and most importantly make you hungry for more. My goal is to focus on local (Tucson) eateries and food related businesses with a voracious yet lighthearted approach seeing as eating is fun and shouldn't be taken all that serious. I mean, I'm serious about food it's just that...well...you'll see. Plus I'm extremely adventurous and not afraid to try anything. It must be the lifelong Metalhead in me. Speaking of which, I plan on melding my stories with whatever metal song I am listening to at that moment or ones that inspired my visit or recipe. What more could you ask for? Food and Metal! Two great tastes that go (hopefully) great together. And, of course, I plan on travelling and eating and writing my way through my stomach sojourn. Tucson is where I call home I live but the world is where I live. But I love the food in Tucson! Beyond Sonoran hot dogs, this place is a fooder feast for the senses...and it's only getting bigger and better. Hopefully with sites like The Homeskillet, we can get the word out that the Old Pueblo is a serious threat to the culinary world. But not too serious. I mean... You know.